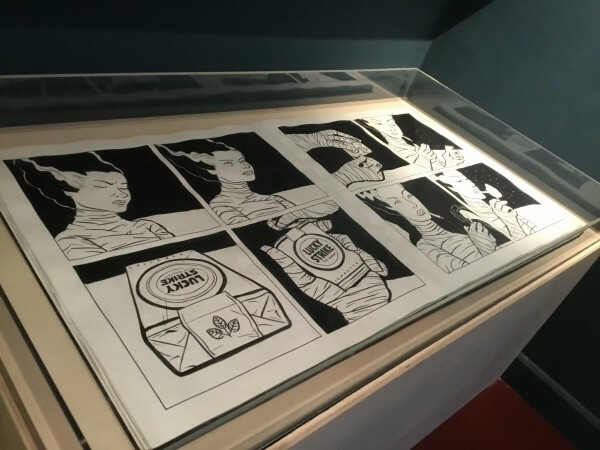 How could we show the history of graphic novels – and all the different types of graphic novel – and provide visitors with a way of navigating the different parts of the exhibition? 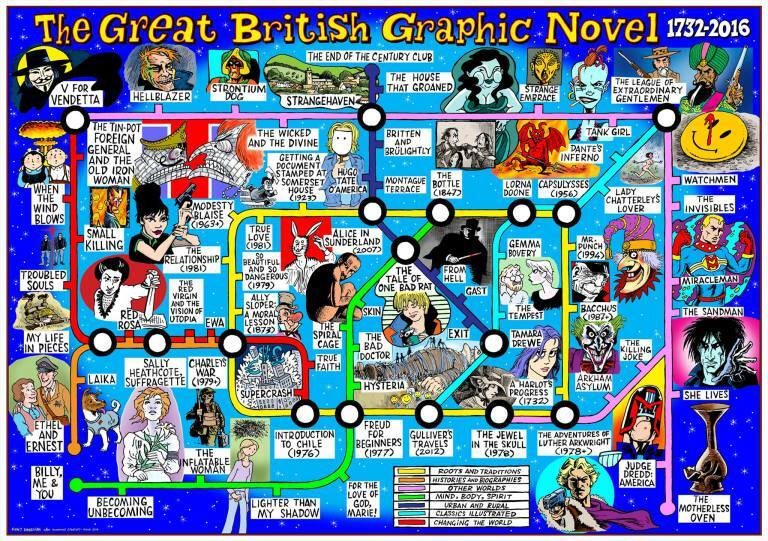 We decided to visualise the graphic novels on display as stations on a map of the London Underground, where the lines represent the exhibition’s sections. The whole idea was brought to life as a spectacular image drawn by veteran underground comix artist Hunt Emerson. As you can see, he’s added characters and symbols from the graphic novels themselves. And if you think it looks good on a computer screen, the first thing that greets you when you walk into the main gallery is a giant version of Emerson’s map! Have you heard of graphic medicine but want to learn more? Come to the event on 13th July! You can also catch Monica Walker’s Spotlight Talks focusing on key works in the exhibition! Size matters, right? Well, the multimedia art of Dave McKean is enormous and spectacular. One of the graphic novels McKean famously worked on was The Sandman, written by Neil Gaiman. McKean’s covers gave the series a distinct look that set it apart from other comics on the rack and in the exhibition you can see that McKean didn’t just draw the covers, he constructed them as large-scale, three-dimensional art objects that absorbed mementoes and found objects. Another gigantic exhibit in the show is Woodrow Phoenix’s She Lives! This is a one-off graphic novel. We’re displaying the book that Phoenix made by hand because there is no published version. Not many people would have room in their homes for it! There is only one copy in the world and it’s on show in The Great British Graphic Novel. And while you can’t turn the pages yourself, you can (a) come to one of the page-turnings and have Woodrow Phoenix take you through the story himself, or (b) the pages can be viewed on the video screen next to the book. My research is about the history of graphic novels and the opening section of the exhibition shows how comics have grown in length, been published as books, and been read by adults (all things associated with the graphic novel format) over the last 300 years. To reflect the influence of engraver William Hogarth on later artists, the exhibition starts with some prints from Hogarth’s sequence of images A Harlot’s Progress (1732). Contemporary creators are not only influenced by the history of illustration, they appropriate and rework artistic traditions, and Eddie Campbell’s Bacchus is a great example of this. In the 1980s and 1990s Campbell depicted the present-day exploits of Bacchus, the Greek god of wine and revelry, and in one scene (shown in the exhibition) Bacchus is chased by Mr. Dry (a character based on Prohibition-era political cartoons) through a mini-history of alcohol-related paintings, starting with Hogarth’s Beer Street (1751). One of the pleasures of curating the exhibition was illuminating how the country’s leading artists go about producing their graphic novels. Some of the draft work on show includes character designs and page layouts (sketches that outline where panels will go on a page and what goes in each one). Visitors can see the lengths Hunt Emerson went to in his adaptation of Inferno, drawing his own map of the underworld to help him recreate the events in Dante’s original. You can also see how artists like Katie Green work with computers as well as pencils and ink. All of this, we hope, will inspire visitors old and young to pick up different tools and have a go at making comics for themselves! At the end of the exhibition we’ve spotlighted three works by Kate Charlesworth, Asia Alfasi, and Jade Sarson which are still in progress but are shaping up to be classics of the future. The work of Alfasi and Sarson demonstrates the influence of Japanese comics on British graphic novelists (elsewhere in the exhibition, the art from the Manga Shakespeare series is another example of this). Jade Sarson’s book For the Love of God, Marie! is forthcoming as I write this but it will be published by the time The Great British Graphic Novel closes. It’s edifying to spend years putting an exhibition like this together and for people to enjoy it. We haven’t been able to show art from every British graphic novel ever published, but what we’ve included has received some very positive reviews. If you’re already a passionate reader of graphic novels and are expecting to see your personal favourites, the chances are you won’t be disappointed. 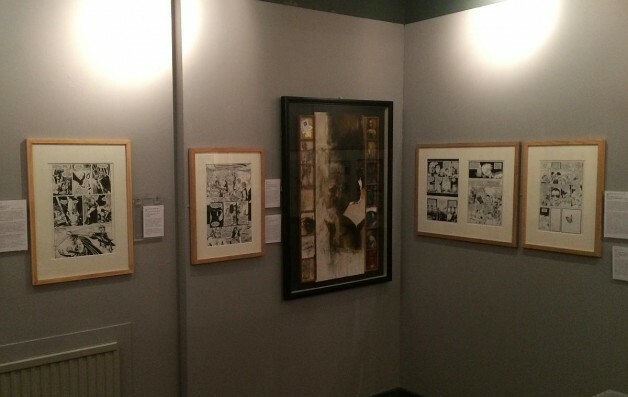 There’s art on show from Posy Simmonds’s Gemma Bovery and Tamara Drewe, The Sandman by Neil Gaiman and various artists, Alan Martin and Jamie Hewlett’s Tank Girl, Bryan Talbot’s Alice in Sunderland, and Grant Morrison and Dave McKean’s Arkham Asylum. 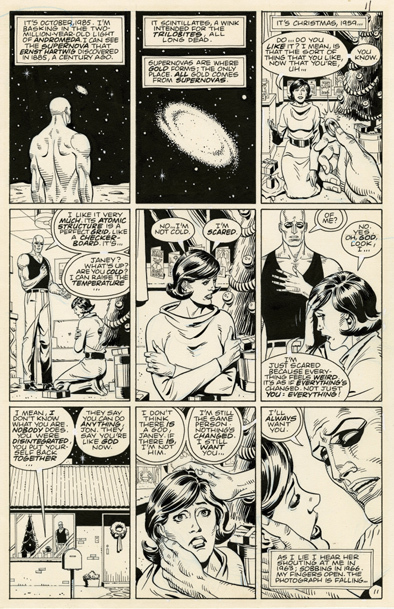 Alan Moore is one of the most written-about comics writers of all time and we have pages of art from five of his graphic novels: From Hell (art by Eddie Campbell), Watchmen (Dave Gibbons), V for Vendetta (David Lloyd), A Small Killing (Oscar Zarate) and League of Extraordinary Gentlemen (Kev O’Neill). Dr Paul Williams is a Senior Lecturer in the Department of English in the College of Humanities at the University of Exeter. He is currently researching how comics became graphic novels in the long 1970s. This project is funded by an AHRC Early Career Research Fellowship (2014-16) and you can read more about it on his blog. 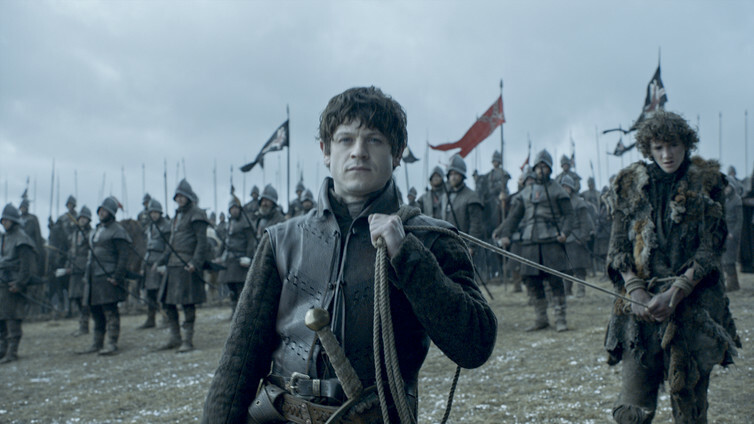 Summer means conference season in academia. From casual graduate symposia popping up across campuses, to the vast annual international gatherings of scholars in one dedicated field, there will be the congregation of academic minds. Whilst undergraduate marking looms like an unmovable mountain in May, come June and July academics will be packing suitcases and embarking on trains across the country, and indeed airplanes around the world. It’s a romantic image to think on such an international scale. But before that, there has been the search, which for most academics today begins online, alone. Finding a conference can be a challenge, especially when you are starting out in academia. There are just so many possibilities out there. Since beginning my PhD I have attended and presented at some great conferences and some truly dire ones. I have spoken in a room to six people, and an auditorium of 200. There is a really great article by Cornelia Oefelein that details different kinds of conferences, which can be found here. Over time, I have learnt that where and how you search, changes the kinds of conferences that you will find. Below, I detail my favourite places to look for conferences and what they are especially useful for, alongside the disadvantages. As a humanities scholar these are biased towards the arts and humanities disciplines. I also maintain that perhaps the best place to find out about conferences is by talking to friends and colleagues. Advantages: Of the numerous sites out there, H-Nets Academic Annoucements is my favourite conference database. It offers a convenient way to narrowing down the vast number of conferences out there. Tick boxes and filters mean that you can choose to search for conferences with “Call for Papers” that are still open (i.e. you will be able to present) or for conferences that are open for registration. You can search by location, subject or keyword terms. Another good place to look if you are in English Studies is the University of Pennsylvania’s CFP database. It isn’t as beautiful as H-Net but it does have a load of conferences for literature / Digital Humanities scholars. Disadvantages: Cast too wide a wide net, and you’ll be inundated with conferences and feel overwhelmed. Advantages: If you are looking for a one-day conference (or symposia as it is sometimes called) Eventbrite is a great place to start. Events listed here are often organised by groups of people at one institution, so it can be a really easy way of getting involved in otherwise closed circles. I recently attended a graduate conference at UCL on the theme of “Dissidence” via Eventbrite. People attended this particular event from all across the U.K, testament to the potential reach of this platform. These events have the benefit of being public too, meaning that you might get a wider and more diverse audience for your paper = win! Disadvantages: The events here only usually last for a day, meaning that you miss out on the potential to make stronger connections over a few days. Advantages: Some of the best conferences I have been to have been recommended by colleagues on Twitter who’ve spotted a CFP elsewhere. Twitter allows you to expand the power of personal recommendation to a wider circle of peers. “Following” people in your field, and looking at the conferences which they are organising / attending / tweeting about is a great way to find places to get involved. Disadvantages: You need to be able to discern between a meaningful recommendation and an automated plug. Like the conference databases, there is an over-abundance of information on Twitter. Advantages: The biggest conferences are hosted by large organisations. Following these centres via membership, mailing lists, RSS feeds, or social media provides an excellent way to stay in the loop in regard to conferences. These large events pull a greater number of colleagues, have world-leading experts and tend to have the largest catering budget! Disadvantages: They can be competitive to present at and so applying for these is more likely to result in rejection. Try not to be disheartened though, as sometimes they also result in success and an excellent chance to disseminate your ideas.